Sara Bess BCB has Fantom Chex on the top and Dinger on the bottom. 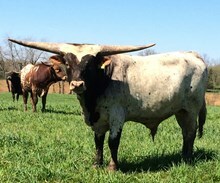 She is a pasture favorite of ours here at Hudson Longhorns. She weaned a bull calf dob 10/3/14 sired by Cowboy Tuff Chex named Bull Market, that was very nice. This cow does a good job every year raising her calf. 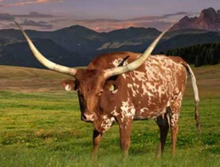 This is a very complete and solid cow.